Idaho | Washington Fence - Sense 1977 Areas Oldest and Finest. Since 1977 Areas Oldest and Finest. Idaho | Washington Fence is the premiere fence company for Post Falls, Coeur d’Alene, Spokane, Sandpoint, Bonners Ferry, Rathdrum, Priest River, Hayden and surrounding areas. Idaho | Washington Fence is a fencing Super Store offering a vast inventory of materials, professional installations and expert advice for the do-it-yourselfer. You will find everything from commercial and residential chain link, vinyl, ornamental steel, cedar boards and split rail cedar, along with all varieties of farm and agricultural fencing, including treated posts and rails, deer netting, barbwire, field fence and welded wire. We carry only the highest quality materials from our trusted vendors. Our skilled installers are specialized in building commercial and residential fencing. Idaho | Washington Fence installers also have cutting edge technical experience in farm and ranch installations. Check out the gallery and view all the varieties and styles of fencing we offer. Call us today for a free estimate. 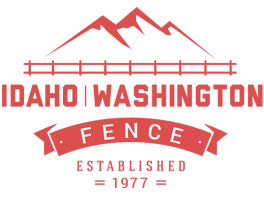 Join the NW best Fencing company sense 1977, When you join Idaho | Washington Fence, you join a diverse team thats passionate about there work. We consider all our employees as family and take great pride in the quality of work we deliver.